The earliest postcards weren’t actually postcards at all. They were trade cards, designed to be collected as souvenirs for the pictures on their faces. Their reverses were filled with advertising text. Cleverly designed, they were advertisements that people chose to keep around. This card on the left is an advertisement for Eldorado Engine Oil, “the best oil made.” On its face is a reproduction of an etching of the monument to James A. Garfield, America’s assassinated president, who was laid to rest in Cleveland, Ohio’s Lake View Cemetery. The etching puzzles me. 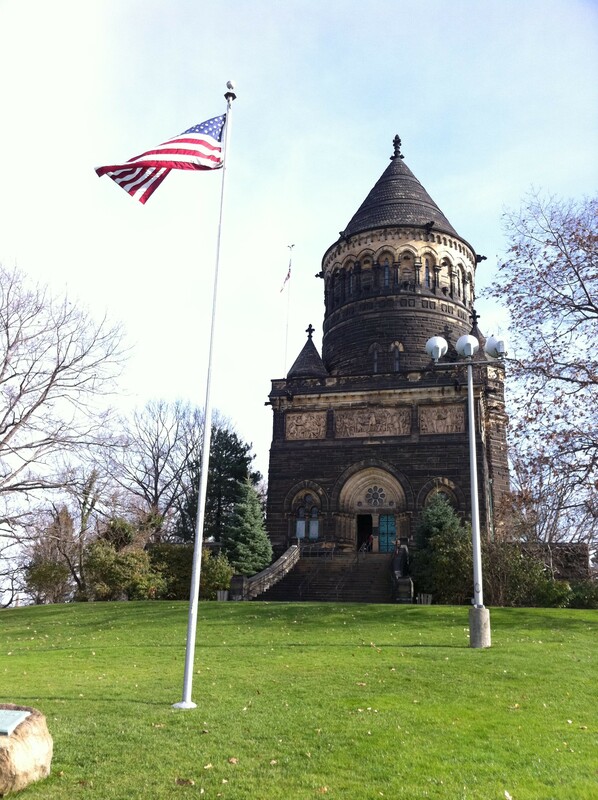 The monument resembles the Garfield Monument, in that it has a similar square Romanesque base and a conical tower. However, the tower as built wasn’t nearly as tall. I don’t know if this artwork was based upon the original architect’s plan (which wasn’t entirely executed for some reason) or if this is an artist’s rendering from imagination, description, or another source. It’s clearly not from life. Even the stairways and terrace are different — though eerily similar. 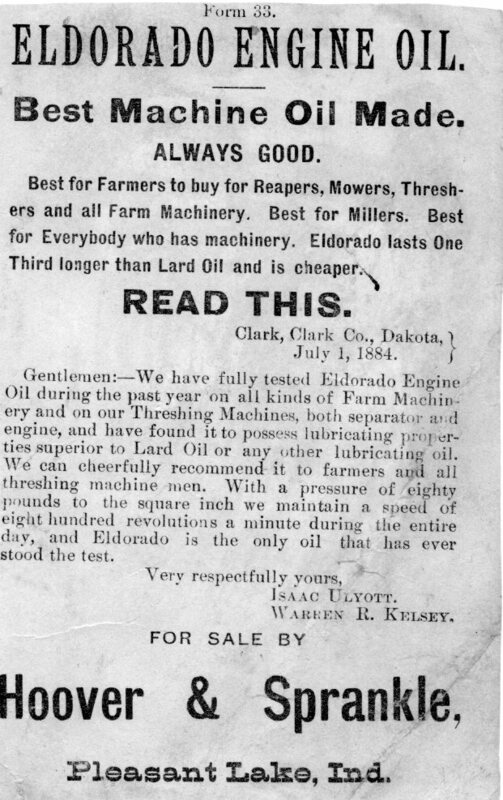 Gentlemen: — We have fully tested Eldorado Engine Oil during the past year on all kinds of Farm Machinery and on our Threshing Machines…. So the card can’t be earlier than 1881, when Garfield died, and is probably no later than 1890, when the President was entombed. 1884 seems as likely a date for it as any. This card was never intended to be sent through the mail, though. (In fact, the penny postcard stamp was not put into use until 1898). This card is printed on very thin card stock or very sturdy paper. It survives because it was pasted into an album. The advertising side of the card is still slightly rough with remnants of the adhesive. It’s the oldest card in my collection. So far, anyway. This entry was posted in Cemetery postcard and tagged James A. Garfield monument, Lake View Cemetery, Ohio cemeteries. Bookmark the permalink. What an amazing piece of “futurism” (in that the tomb wasn’t built or completed when the card was published)! “Futurism” is a great way to look at it! The card says that the monument is 225 feet high, about 20 stories tall. 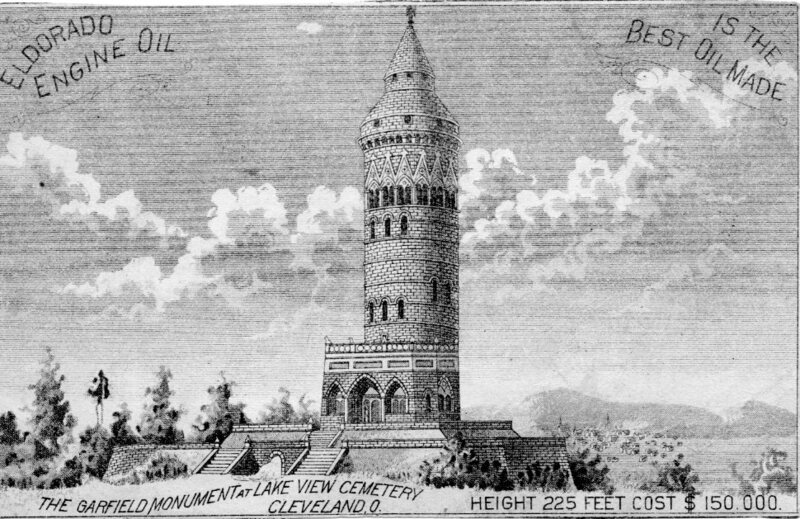 As built, it’s the tallest thing for miles, since it stands on a bluff overlooking Cleveland and the lake. I think they made a sensible choice in shortening it. I love old postcards! They reveal a lot about what people in the past thought was important or funny, things we might not discover about them in any other way.